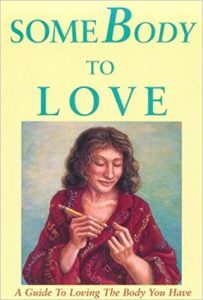 This is a book about loving yourself. What does that have to do with eating and body size? Everything. I mean loving yourself right now, whether you weight 400 pounds or 65 pounds, or anywhere in between. I mean loving yourself with your soft flabby belly, with your thighs that chafe, with your Jewish-shaped nose, with your frizzy hair, with your upper arms that jiggle and your round behind that wiggles. Loving yourself with that weird little toenail that’s hardly even there, your crooked teeth, your pimples at a certain time of the month and your breasts that are two different sizes. This book is about loving you, all of you, just as you are right now, even if you’re stuffing fistfuls of popcorn into your mouth while reading this book, or interrupting yourself every third sentence to figure out how many calories you’ve consumed today or how much weight you’re going to lose by next July. This is not a book about how to lose twenty pounds in ten minutes or how to have thinner thighs in thirty seconds. This is not a book about how to lose weight at all. Wait. Please. Those of you who are about to put this book back on the shelf, I implore you to bear with me just a little longer. Believe me, you can pick up any diet book in just a minute. They’re a dime a dozen. The reason there are so many of them is that none of them work. You know this as well as I do. You know you know it. Why not just consider something different? There is a story about a woman who walks down a street and falls into a hole. It is a deep hole and it takes her most of the day to climb out of the hole but she does manage to get out and continue on her way. The next day she walks down the same street and falls into the same hole again. This time it only takes her half a day to get out. The next day she walks down the same street and falls into the hole, and within an hour she has climbed out. The next day she walks down the same street and trips over the hole, but catches herself before she falls into it. The next day the woman walks down the same street and walks around the hole. The next day the woman walks down a different street. This book is the different street, the alternative to the deep hole of dieting so many of us fall into….